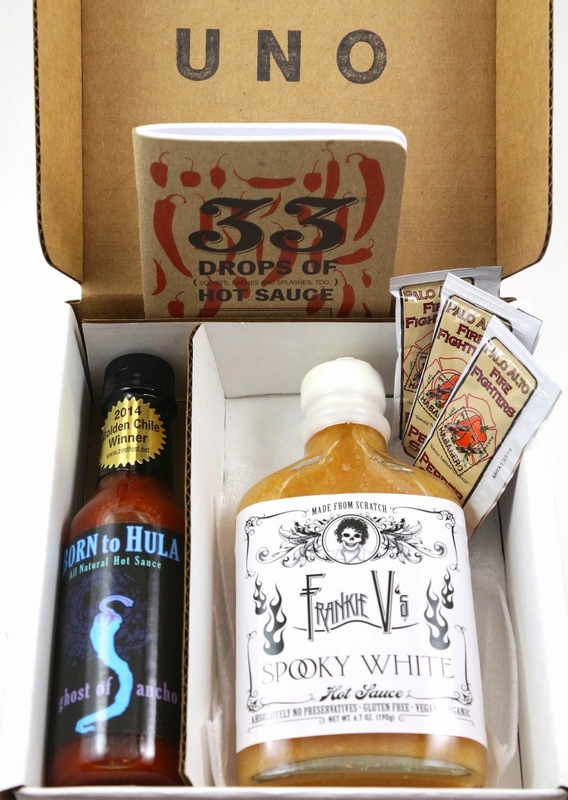 Fuego Box is a new subscription box targeted towards hot sauce lovers! I put hot sauce on almost everything, so when Fuego Box contacted me asking if I would like to try their new subscription box, I jumped at the chance! 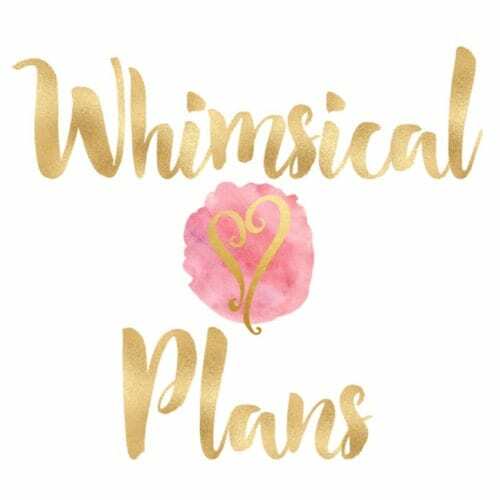 I was sent the first three months of the subscription, so you'll get a pretty good idea of what to expect when you subscribe. 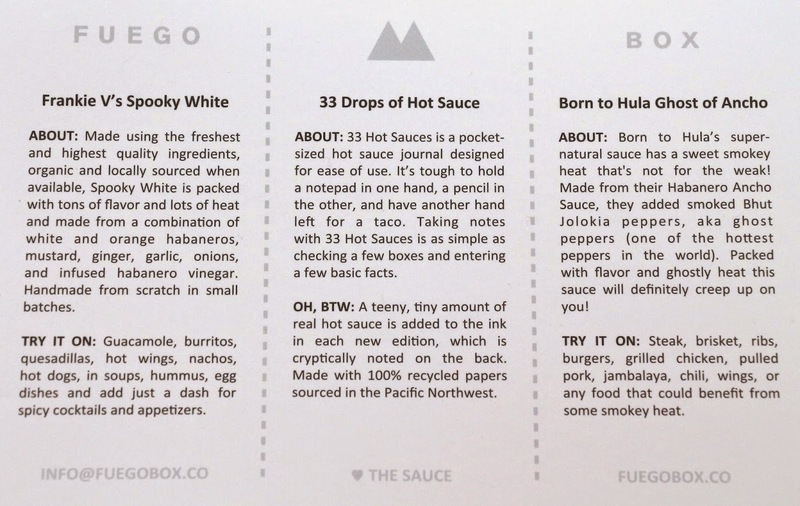 Each month's box includes this handy informational card with a little background and info about each hot sauce, as well as some serving tips for what foods the sauce pairs best with. This is the only one I haven't opened yet, just because it's such a big bottle, and I don't want it to go bad before I have a chance to use it. 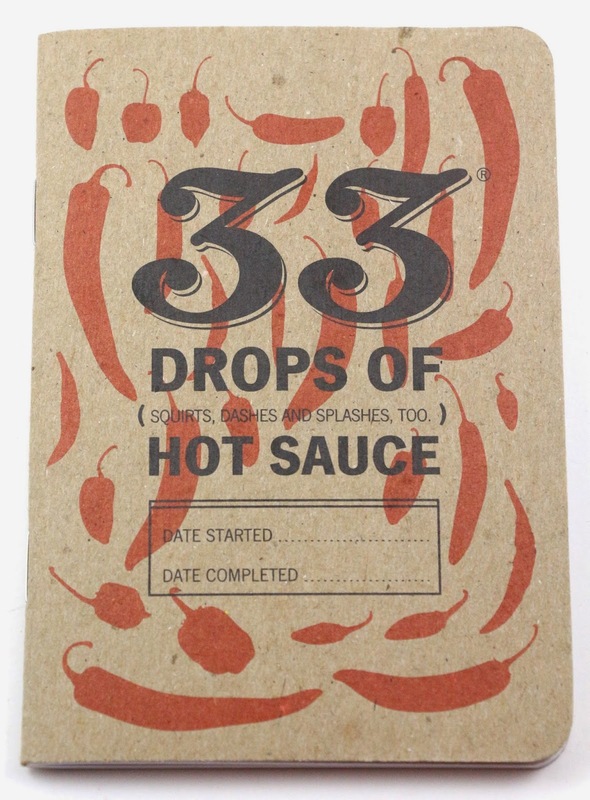 Fuego Box always sends first time subscribers Box #1 so you get this special little booklet to document your hot sauce journey and reviews. The ink even has some hot sauce mixed in and it tells you on the back which brand of hot sauce they used! 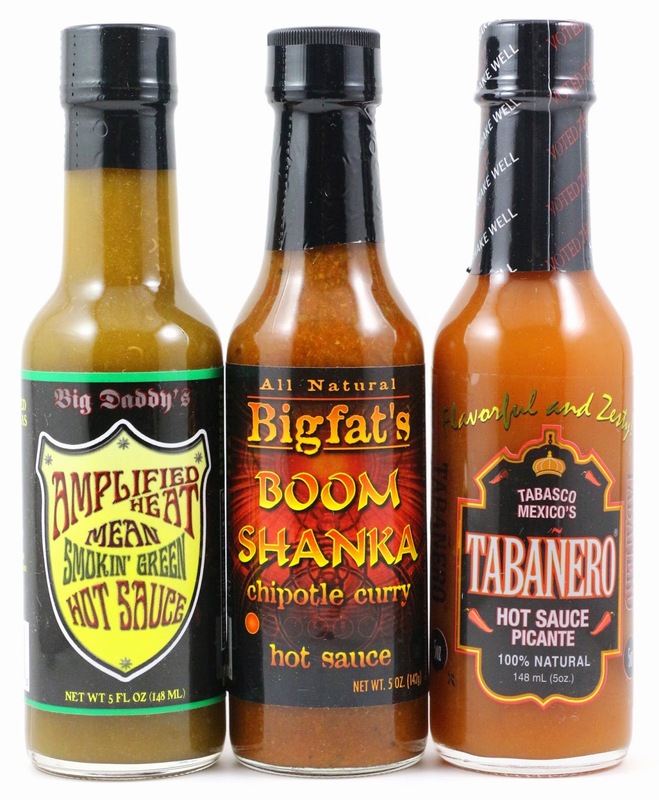 This was actually one of my favorite hot sauces out of all of them, it works great on eggs, tacos, quesadillas, anything where you want something with quite a bit of kick. It's pretty spicy if you're not careful with how much you use. It will clear your sinuses, that's for sure! This one will work best on most Mexican foods I think. I also really liked this one, it's too bad they come in packets because I want a whole bottle of this one. But the packets were really convenient you could take these around to any restaurant with you, especially for those restaurants that have sub par hot sauce. I might buy a case of these packets, they're cheap, portable, and really good! They also have a regular, non-habanero version of this sauce as well. I found a bottle of this at my local Whole Foods, so B and I grabbed this and used it in chili! It was awesome! Box #1 had a total value of $19.60, and I liked the little extra booklet and the Palo Alto Fire Fighters hot sauce packets. 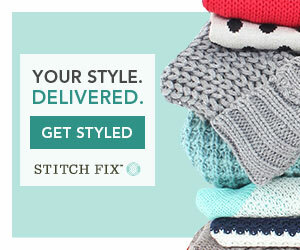 I am really glad you would always get this box no matter when you subscribe, because it was my favorite box overall. 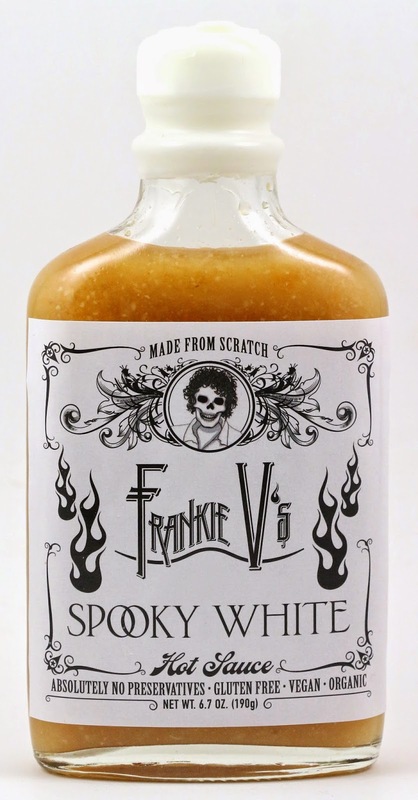 The 2 out of 3 sauces I tried were amazing, and I have no doubt the Frankie V's sauce will be great as well. I love the little info on the card about what foods go best with each sauce. We tried all of them on eggs, but some definitely go better with certain foods. This one was good, especially if you are a fan of green sauces. It was really smoky, but definitely unique. Not like the typical green sauces you get at the grocery store. This one B and I really liked, but it's definitely meant for Indian food, or something where you won't mind having curry mixed in. It might be good mixed into a steak marinade I think. This one is kind of like the quality made Tabasco equivalent, but much better. There is no hot sauce I hate more than Tabasco, but this has got that same sort of vinegary light hot sauce flavor, but made with fresh quality ingredients. Box #2 had a total value of $17.50, and this was probably my second favorite box. I didn't love it as much as box #1, but it had some good sauces in it. It was definitely on the lower end of the heat scale, mostly mild sauces. 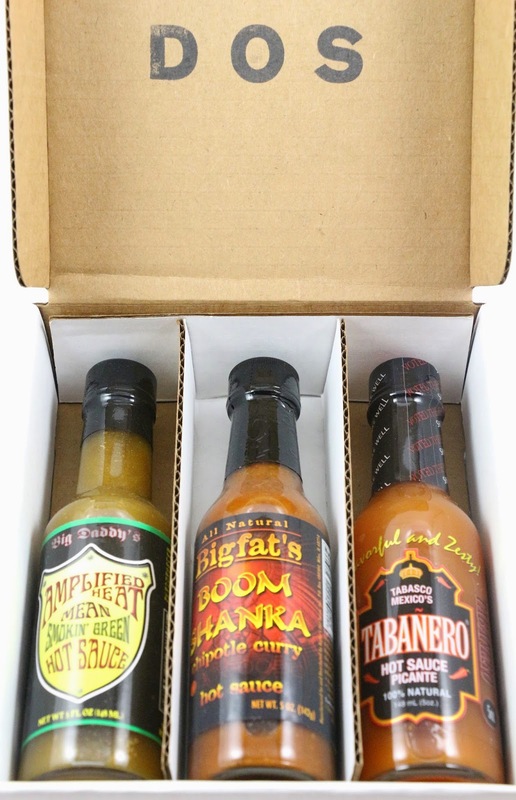 I think this is a good box if you're not into a lot of heat in your hot sauces, but then why would you be getting a hot sauce box? 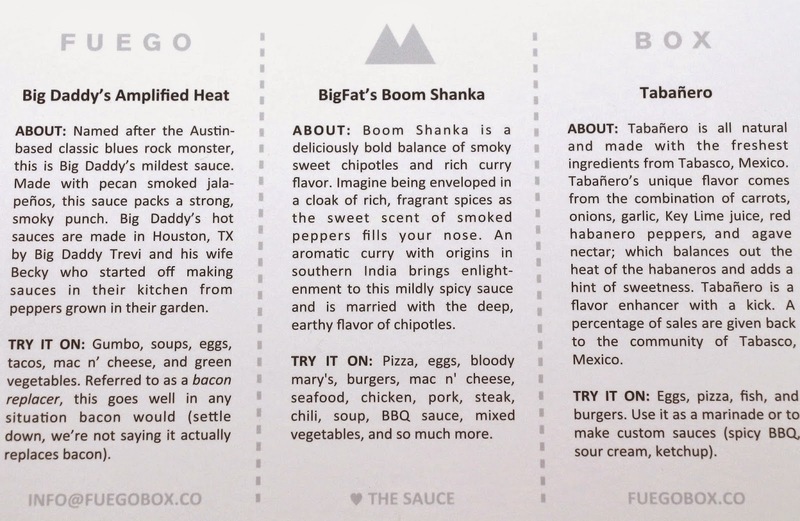 And the Boom Shanka sauce was one of the most unique sauces of the bunch. I think this was B and my least favorite sauces of all of them. 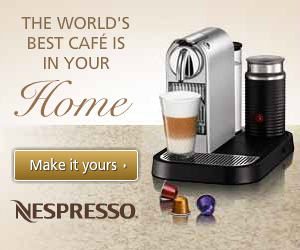 It just did not taste good to us. This one is called surprisingly mild for a reason, it was not hot at all. If you like the flavor of hot sauce without the heat, this is a good option for you. We also didn't really care for this one either, not that it's bad, just not for us. Box #3 had a total value of $20, and was my least favorite box of the three I received. These sauces were our least favorite in terms of flavor and in heat. They weren't hot enough for our liking, and the flavors didn't pair well with the foods we tried them on. 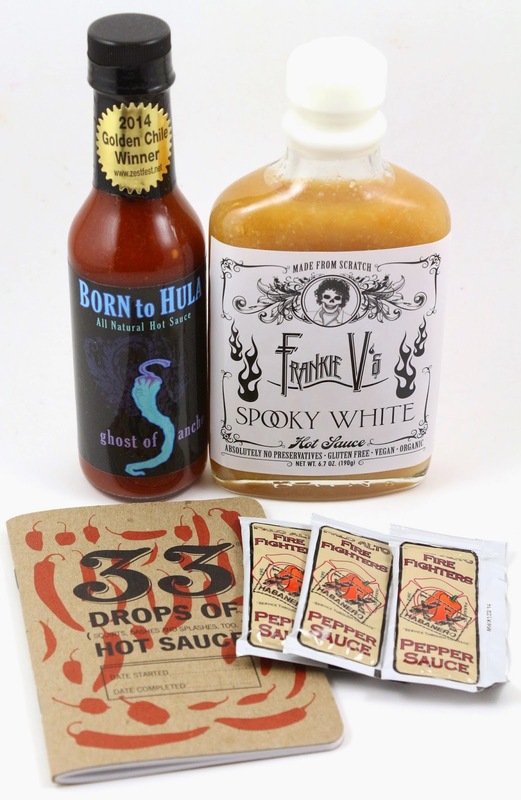 Overall, I think this is a great subscription for hot sauce lovers, who want to explore heat and the varying hot sauce flavors from all over. 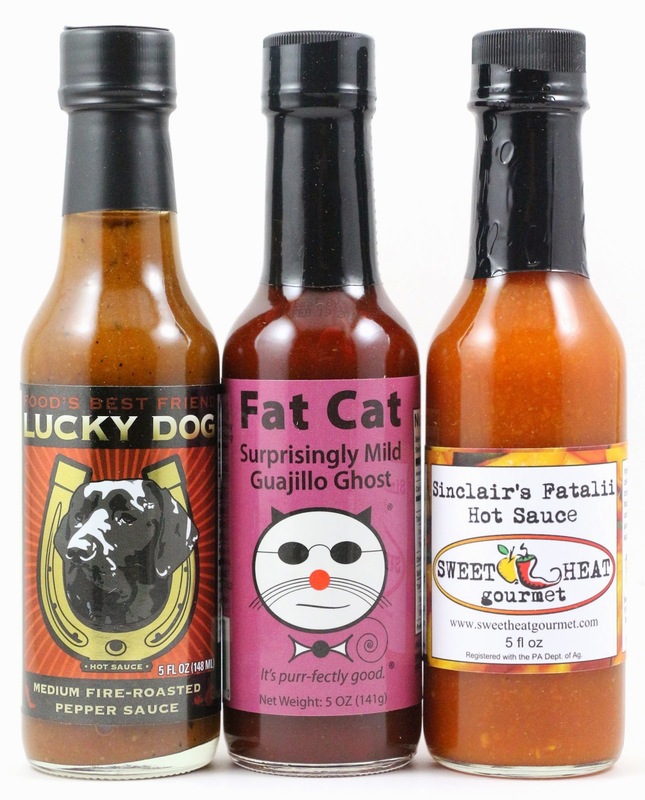 It would make a fun gift, or just for yourself if you're not able to find lots of hot sauces locally. I think once you've tried a few months of it though, you would have the resources you'd need to find hot sauces on your own, since the value of each month's box is a little low compared to the price you pay for it. 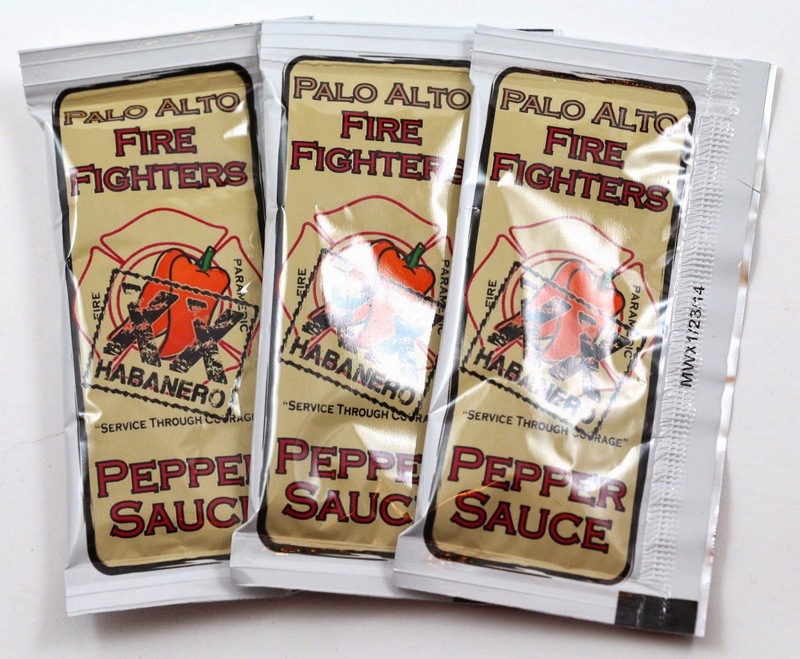 However, the price does include shipping, and hot sauce can get heavy, so that may make it cheaper in the long run. 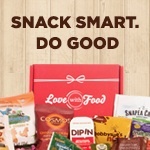 Monthly or quarterly, sign up by the 1st of the month to receive that month's box. Boxes ship by the 12th, also billed on the 12th. You will always receive Box One as your first box, after you receive that month's box. 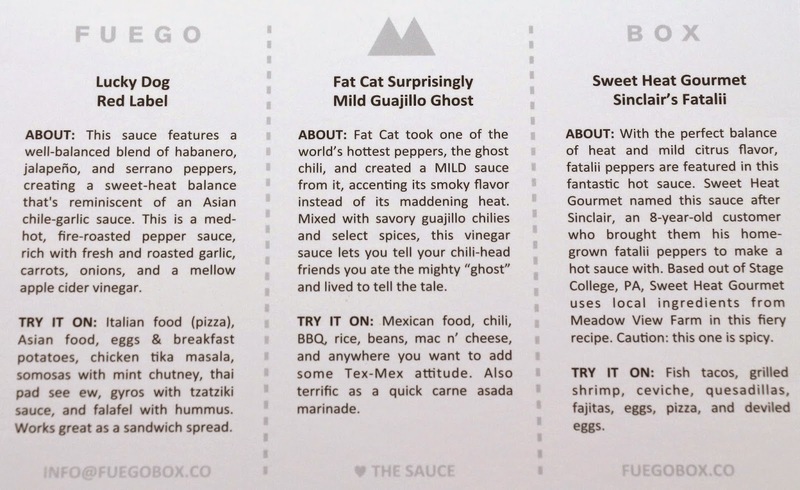 What did you think of Fuego Box? Let me know in the comments! 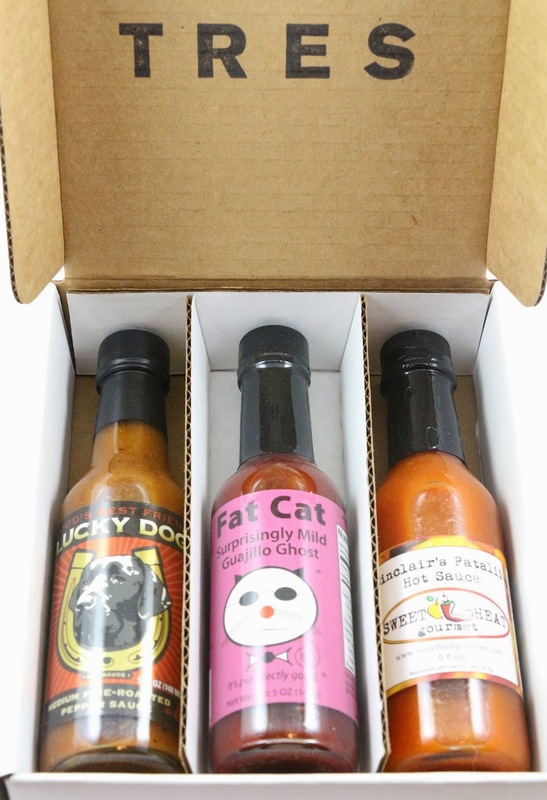 I love hot sauces and a hot sauce subscription box is a neat idea, but honestly, it just seems too expensive to be worth it to me. I'd rather just go buy myself hot sauces I think I'll like at the grocery store and not have to pay for shipping.